Information about school life for parents' and guardians of students in Confey College. 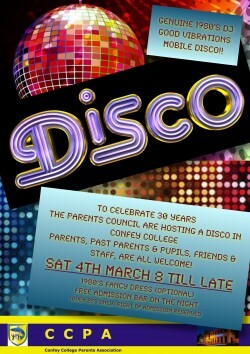 To celebrate 30 years of our college, Parents Council is inviting everyone connected to the Confey College for a DISCO Party! All Parents, Past Parents & Pupils, Staff and Friends are Welcome! !